My neighbor's daughter, Cindy. 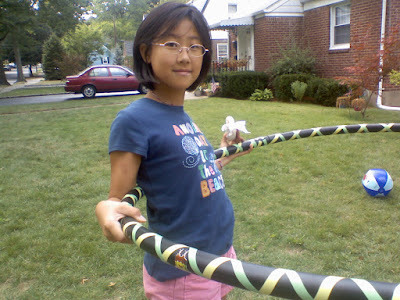 She decorated her JenniHoop by herself! 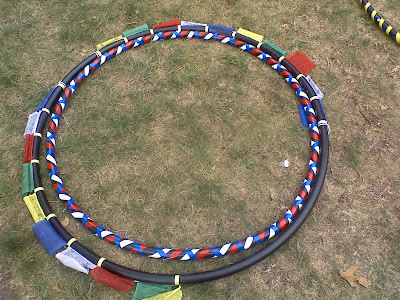 The Tibetan Prayer Flag hoop and another smaller one. Melissa, my neighbor and supplier of free labor. Also, she is the ever-so-lovely base of this JenniHoop pyramid. This is our front yard filled with everyone hula hooping. What fun! 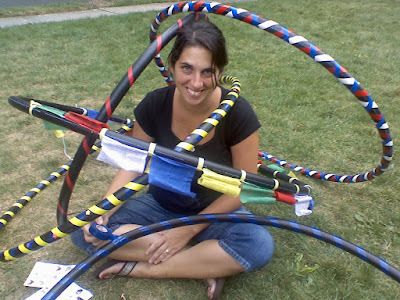 I'm using the prayer flag hoop, my favorite, though I wish the hoop was a smidge smaller. Maybe I'll remake it. I never met this man before- he was driving his car with his girlfriend past our house and when he saw us all hula hooping, he put the car in reverse to back up and watch. We yelled for him to come try, he said he can't hula hoop. Here's his first attempt. Sorry for the terrible sound. Maybe I'll get a new video camera.